Hamas spokesman Fawzi Barhoum said that Israeli Prime Minister Benjamin Netanyahu's announcement that Tzipi Livni would handle efforts to renew peace talks with Palestinians determines features of the next stage and put an end to negotiation process. Barhoum said in a press statement published on his Facebook page on Wednesday: "This is a confirmation of the failure of the option of negotiations and determines its inevitable fate." The proposal that came up during the Israeli-Palestinian talks in Amman effectively means a withdrawal from 90% of the West Bank, and is very similar to the one proposed by Tzipi Livni during the 2008 Annapolis Conference. Three weeks after the end of the talks that took place between Israel and the Palestinians in Amman which took place under the patronage of the King of Jordan, Israeli officials revealed their version of the events, laying the blame on the failure of the talks on Palestinian Authority leader Mahmoud Abbas. Despite the mutual “blame game,” according to positions presented by Prime Minister Benjamin Netanyahu on the topic of borders, it is clear that it is not much different than the positions presented by Tzipi Livni during the Annapolis Conference. The five rounds of talks in Amman were the result of international pressure placed on Abbas immediately after his speech to the UN General Assembly in September 23 2011. On that same day, the members of the Quartet – the United States, Russia, the European Union and the United Nations – declared a new outline for talks and called on both sides to respond positively. After a few weeks, both Israel and the Palestinians responded to the request with a “yes, but…” with both sides presenting a list of reservations. A month after the assembly, delegations from the Quartet arrived for first-round talks with Israeli and Palestinian representatives. According to a top Israeli official, on the day of the meeting, the prime minister’s envoy, Isaac Molho, arrived at the hotel and entered the meeting room only to discover that his Palestinian counterpart, Saeb Erekat, did not make it to the meeting. 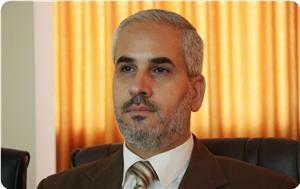 Mohammad Shtayyeh, a of Fatah’s central committee was sent in his stead. The Palestinian side did not agree to sit with Molho in the same room, and the envoys were resigned to hopping between different rooms in the hotel in order to hold discussions between the two sides. For over a month, the Quarter envoys attempted to bring the Palestinians to the negotiation room, but only when King Abdullah II began to apply pressure did things begin to move. The king came to Ramallah on a rare trip and pressured Mahmoud Abbas. Finally, on January 3, the Jordanians were able to bring together Erekat and Molho in Jordan’s Foreign Ministry in Amman. A senior Israeli official said that the January 3 meeting began in a wider forum where Jordanian, Israeli and Palestinian officials were present, as well representatives of all the Quarter members. While speaking in front of no less than 20 people, Saeb Erekat pulled out two documents: one on the Palestinian position regarding borders, and one on the Palestinian position regarding security. The Palestinian documents were not surprising. On the topic of borders, the Palestinians called for a return to 1967 borders with an acceptance of land-swaps of 1.9% of the West Bank. On the topic of security, the Palestinians agreed to a demilitarized state (devoid of heavy weaponry), and the stationing of an international force on the border between Israel and Jordan, with no presence of Israeli soldiers. After the meeting in the general forum, the sides moved to a smaller meeting with only Israeli, Jordanian and Palestinian representatives alone. According to the Israeli official, the Palestinians immediately demanded a freeze on settlement building, freeing prisoners and emphasized that from their point of view, the talks would end on January 26 as that was the date that the Quartet set for negotiations on the subject of borders and security. The Israeli delegation was surprised by the announcement. “We had just begun and you are already threatening to end the talks,” said Molho to Erekat. The Israeli side emphasized to the Palestinians that the talks are only in their beginning stages and that with such a short timeframe it is impossible to hold serious negotiations. At that same meeting, Molho presented a 21-point document that included all the topics Israel is interested in discussing during the talks, including borders, Jerusalem, settlements, security arrangements, Palestinian incitement and more. And although the document included all the points, it did not include any of the Israeli positions. The meeting produced very little progress, except for the fact that the two sides agreed to decide on another two meetings that would take place during January. On January 9, a second meeting took place between Molho and Erekat, this time in a smaller forum. Present alongside the Israeli and Palestinian negotiating teams was Jordan's Foreign Minister Nasser Judeh and his top adviser. Molho, who went over the documents presented by the Palestinians during the previous meeting, passed along a document with 19 requests for clarification regarding the Palestinians' positions. One of Molho's questions was about the future of the settlements in the Palestinian state. Would they be evacuated or would they be allowed to remain? From the question it is clear that Netanyahu's position on the issue of borders is that at least some of the settlements will remain where they are in a Palestinian state and will not be evacuated. "Erekat told us that he prefers not to respond to the question, and until this day we have not received an answer," said a top Israeli official. Another question brought up by Molho to Erekat had to do with the PA's relationship to Hamas and the situation in the Gaza Strip. Erekat responded that the Palestinian state will be "a strong democracy," and blamed Israel for Hamas' takeover of Gaza. Molho further asked whether the position on borders was final. The top Israeli official claimed that among the Palestinian delegation there were contradictory positions on the issue. "On the one hand, Erekat told us that the documents are not the Quran and are not holy. On the other hand, Mohammad Shatyyeh told us that the Palestinians had already made their compromise and that a land swap of 1.9% is the maximum they are willing to give," he said. "In the end, the Palestinian proposals were a step backward from the more progressive positions that they presented in Annapolis." A third meeting between the two sides took place on January 14, but did not produce any results. During a meeting on January 18, the Israeli delegation brought with it the Head of the Strategic Planning Division in the IDF Planning Directorate, Brigadier-General Assaf Orion in order to summarize Israel’s position on security arrangements. The Palestinians refused to allow him to speak. “We came to the meeting place and were delayed for an hour and a half because the Palestinians were not willing to hear the Israeli general. They said that they are not willing to hear a military person speak,” said the Israeli official. When both sides finally entered the room, Erekat handed Molho a letter that demanded the release of Hamas member and Speaker of the Palestinian Legislative Council Aziz Duwaik, who was arrested a few days earlier. A few hours later, the contents of the letter were leaked to the Palestinian media. The Israeli side also presented documents to the Palestinians, including one on incitement against Israel in the Palestinian media. The document contained quotes from the Mufti of Jerusalem that called for the killing of Jews. Erekat rejected the claims. “The accusations are wrong, and in the end you will have to apologize for this slander,” said Erekat to Molho. In the meeting that took place afterwards, the Palestinians had understood that they had a problem on their hands, and suggested organizing a joint committee that would deal with the issue of incitement. Head of Israel’s National Information Directorate Yoaz Hendel, who participated in the meeting, told Erekat that instead of organizing a committee, they themselves can take care of the issue of incitement. On January 25, a day before the date which the Palestinians threatened to walk out on the talks, the final round of talks took place between the sides. During the discussions, Molho presented Netanyahu’s proposal on the borders of the Palestinian state. 1. The border will be drawn in a way that will include the maximum amount of Israelis living in the West Bank, and the minimum amount of Palestinians. 2. Israel will annex the large settlement blocs, without defining what exactly is considered a ‘bloc,’ nor defining its size. 3. It is necessary to first solve the problem of borders and security in relation to Judea and Samaria, and only afterwards move to discuss the topic of Jerusalem which is far more complicated. 4. Israel will maintain a presence in the Jordan Valley for a period of time. Molho did not mention how long nor what kind of presence. Molho did not mention how size of the territory from which Israel will withdraw, but according to the principles he presented, it seems that it is similar, if not identical to that which was presented by Tzipi Livni during the negotiations that took place in 2008 after the Annapolis Conference. And although Netanyahu does not admit it, the meaning behind the principles Molho presented is a withdrawal that will cause Israel to give up 90% of its sovereignty. “The possibility of leaving the settlements in a Palestinian state also came up in Annapolis,” said a source that participated in the 2008 talks. Erekat, who understood the principles, asked at the end of the meetings for a series of clarifications: whether Israel accepts the 1967 borders as a basic tenet upon which the two sides can negotiation, whether Israel accepts the principle of territory swaps, how many percentages of the West Bank is Israel interested in annexing, whether Israel has a map with border proposals, whether Israel is willing to evacuate settlements, etc. “I’d be happy to answer all these questions in the next meeting,” said Molho to Erekat. But the next meeting never took place. A day later, the Palestinians said that they will not resume talks unless Israel freezes settlement building and accepts the principle of 1967 borders. Israelis are now admitting that the talks have come to an end and their renewal is not expected anytime soon, especially in light of the recent reconciliation meeting between Abbas and Hamas leader Khaled Meshal in Doha. Up until two weeks ago, Netanyahu had discussed a series of goodwill gestures toward the Palestinians with Tony Blair and the Americans, in order to enable the renewal of the talks. However, the meeting between Abbas and Meshal caused the Israelis to take of the offer off the table. It must be noted that Netanyahu’s goodwill gesture package was much more modest han what the Palestinians and the international community had hoped for. Netanyahu proposed releasing 25 prisoners, establishing 10 new stations for the Palestinian police in Area B (where Israel is in charge of security), as well as a series of economic projects in Area C (where Israel has full control). What now? Officials in Jerusalem are waiting to see which path Abbas will take: reconciliation with Hamas in a meeting set to take place in a week, a return to the United Nations or in a more optimistic scenario – a willingness to return to talks with Israel. “It is unclear what the Palestinians will choose, but we believe they will return to their campaign in the United Nations within a few weeks,” said the Israeli official. The assessment in Israel is that the attempt to establish a unitary government with Hamas will not succeed. However, if the reconciliation does take shape, the Israelis clarify that it will have consequences. “We will not enter negotiations with any government that Hamas takes part in, or that its members are appointed by Hamas,” said the official. He hinted that Israel may once more freeze Palestinian taxes. “We will see what happens at the meeting in Cairo at the end of the month. The political leaders will decide what to do,” he said. The Palestinian Authority (P.A.) in the West Bank intends to ask the United States to present a new peace initiative that could end the current stalemate in peace talks between Israel and the Palestinians. 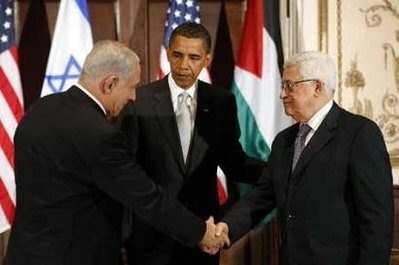 The Palestinian request will be officially made when American President Barack Obama, visits the region next month, Israeli daily, Haaretz, reported. The U.S. will be officially informed of the Palestinian request by Palestinian envoys, headed by Chief Palestinian Negotiator, Dr. Saeb Erekat, and Mohammad Eshtayya, one of the advisers of President Mahmoud Abbas, who will be visiting the United States before Obama departs to the Middle East. Haaretz added that the P.A. is hoping the U.S. will present a viable initiative that could lead to the resumption of direct peace talks with Tel Aviv. 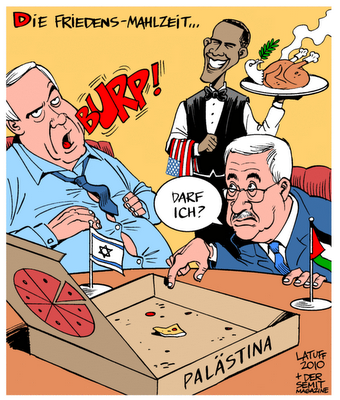 According to Haaretz, sources close to the Palestinian President said that the P.A. is very disappointed that Obama has not presented any new peace initiative during his first term in office, in addition to the fact that the U.S. is granting the Iranian and Syrian file a higher priority, while marginalized the Palestinian issue. Tel Aviv claims it is willing to start direct peace talks with the Palestinians without preconditions, but at the same time is ongoing with its daily invasions, violations, and is escalating its illegal settlement construction and expansion activities. Israel is also escalating its invasions, attacks and arrests against the Palestinians, their homes and property, in different parts of the occupied West Bank, including in occupied East Jerusalem. Western sources said that the revival of the peace process must occur in three steps. First, negotiations will lead to the implementation of the two-state solution. Second, the world must implement procedures to upgrade the status of the Palestinian Authority (PA) and build confidence, such as releasing the prisoners who were imprisoned before Oslo, and to help the PA develop in Area C of the West Bank. The Third step states the necessity to help the PA overcome its financial crisis. The sources also said that pressure would be put on Israel to freeze settlement construction during the negotiations period. 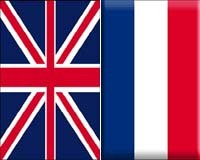 The Al-Hayat Arabic Language Paper in London reported that France and Britain are preparing an initiative reportedly meant to ensure the resumption of direct peace talks between Israel and the Palestinians. The Paper said that France and Britain are also trying to get the United States involved in the new initiative as its success depends on American support. Diplomatic sources told Al-Hayat that the United States will likely resume its efforts to ensure the resumption of peace talks, an issue that would eventually lead to delaying the European initiative. The sources added that the new American Secretary of State, John Kerry, is trying to host an international conference in the United States in order to resume the stalled and obstructed Palestinian-Israeli peace talks. Kerry also intends to appoint a new American Envoy to the Middle East. Israel claims that it is ready to resume the peace talks with the Palestinians “without preconditions”, and that it is interested in serious talks that would lead to an agreement. The Palestinian Authority (P.A.) says that it is not placing preconditions to the resumption of direct peace talks, but cannot return to the negotiation table while Israeli continues its violations and attacks, and while it continues to confiscate Palestinian lands in the occupied West Bank, and in occupied East Jerusalem, in order to build and expand its illegal settlements. The P.A. said that its demands are not preconditions, as Israel should show it is serious in reaching a comprehensive peace agreement that would lead to a two-state solution. Israeli Peace Now movement issued a report about Israel’s illegal settlement construction and expansion activities in the occupied territories, and said that the policies of Netanyahu and his government undermine a realistic peace agreement. Peace Now also reported that in the period between March 31, 2009 and January 2013, the Israeli government issued tenders for the construction of 5302 houses for Jewish settlers in East Jerusalem. Many of the approved units focused on existing settlements such as Ariel settlement bloc, and the Efrat settlement. 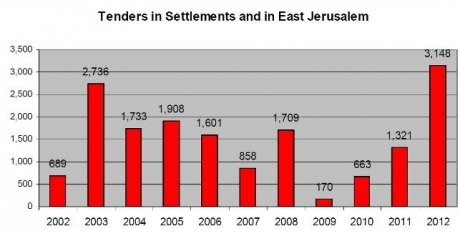 Peace Now said that the expansion of these settlements directly impacts the chances of a two-state solution. Furthermore, illegal units constructed by Jewish settlers without a permit from the government also escalated. Settlers illegally built 911 housing units in illegal settlement outposts, including 456 permanent buildings while the rest were mobile and pre-fabricated units, Peace Now said. Some %77 of the illegal units were built in illegal settlement outposts that are east of the planned route of the illegal Israeli Annexation Wall. As for “Price Tag” attacks carried out by the settlers against the Palestinians, Peace Now said these attacked reached an unprecedented level. The movement reported that the settlers continued to challenge the rule of the law not only attacking Palestinian civilians, property, lands and holy sites in the West Bank, but also carried out attacks inside Israel itself, including death threats against Peace Now activists. Jordan is in the process of consolidating an international coalition to kick-start the stalled Israeli-Palestinian peace process, the country's King Abdullah said Sunday in an interview with French publication Le Nouvel Observateur. "We are working closely with several parties in Europe, including France, to put some effective and workable ideas on the table that would enable the US to engage and play a leading role in the peace process soon after the start of the second term of President [Barack] Obama," Abdullah said in his interview, translated into English by The Jordan Times. Abdullah expressed hope that Germany, the UK, Saudi Arabia, Kuwait and the UAE would participate in the efforts. Negotiations have been virtually nonexistent for most of the last four years, with Palestinian Authority President Mahmoud Abbas demanding a settlement moratorium as a precondition to talks. Abdullah said that he was acting in order to take advantage of a "window of opportunity that is closing down on the two-state solution rather quickly." 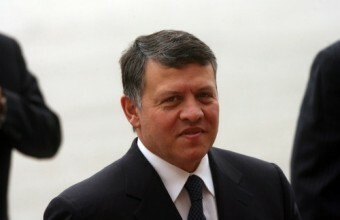 The Jordanian leader cited a confluence of factors which he believes is increasing the likelihood of a peace deal, including: the inauguration of US President Barack Obama, an international community which is increasingly enthusiastic about solving the conflict, the recent successful Palestinian statehood bid at the United Nations, and pressures emanating from the Arab Spring. "We do not have four more years to wait for the next US president to work on Middle East peace, particularly [considering] that Israeli settlements are eating up all Palestinian lands," Abdullah said. Commenting on widespread international condemnation of preliminary plans to build 3,000 new housing units in the E1 corridor connecting Jerusalem with Ma'aleh Adumim, Abdullah said the world was united against unilateral Israeli action in the West Bank. The international community displayed a "strong stance against settlements, which we agree are one of the main obstacles to peace, especially in E1 areas," he said. Israel's Prime Minister Binyamin Netanyahu maintains that construction plans for the E1 area do not preclude the eventual emergence of a Palestinian state, and that his government has repeatedly called for direct negotiations with the Palestinians without precondition. Turning to Iran, Abdullah said at least some Israeli politicians are "very determined" to bomb the country's nuclear sites, though he doubted the feasibility of such a move. "The region doesn't need another conflict, and I hope the Israeli people realize this," he said. The Jordanian king added a call for a "Middle East free of nuclear weapons" – a thinly veiled demand for Israel to dismantle its own nuclear weapons, which Jerusalem has not admitted to having. Diplomatic officials in Jerusalem, meanwhile, said they were unaware of any concrete plans currently underway to bring Israel and the Palestinian Authority to the negotiating table immediately after Israel's elections next week. 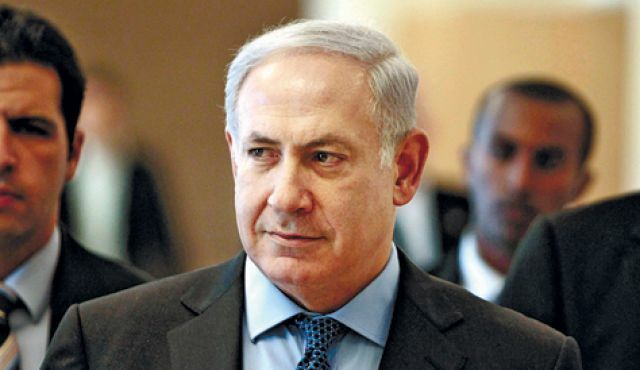 Netanyahu has said in internal meetings in recent days that he hopes that after the elections it will be possible to reengage with Abbas without any preconditions. He has said, however, that he remains skeptical because Abbas seemed more intent at this time in embracing Hamas, rather than in engaging with Israel. The Palestinian President, Yasser Arafat, died at a French Military Hospital on November 11, 2004. On July 31st this year, Soha Arafat filed a lawsuit against “unknown” in France for the assassination of her husband. Many Palestinians believe that Israeli forces which surrounded Arafat in his compound, in 2002, until he fell seriously ill and was airlifted to France, were behind the assassination of Arafat. Israel also bombarded sections of the compound, and bulldozed other sections, in addition to cutting power and water supplies, and phone lines. Israeli sharpshooters also occupied several surrounding buildings overlooking the office of Arafat, and killed five Palestinians in the compound, including members personal bodyguards of Arafat; at least 40 were injured and 70 were kidnapped. Israel also said that two Israeli soldiers were killed in the attack. At the time, some Israeli politicians alluded to the possibility that Arafat had been assassinated, but none admitted it openly. Prior to Arafat’s death, Israeli leaders kept labeling him as an “obstacle to peace”. The then-Israeli Prime Minister, Ariel Sharon, said in a press conference that “invading Ramallah, and the isolation of Arafat is only the beginning of an extended military offensive that aims at uprooting the infrastructure of terrorism”. In the New York Times interview published this week, when asked if he thought that Arafat should have been assassinated, Peres replied “No”, and stated that It was possible for Israel “to do business with Arafat”, and that “without him, the situation became much more complicated”. Peres also stated that Israel could not have reached the Oslo peace agreement without Arafat, and added that the Hebron agreement was also reached with Arafat, but claimed that he “tried to explain to Arafat how to be a true leader”. The Israeli President added that he and Arafat sat together, “with me eating from his hand. It took courage. I told him he must be like Lincoln, like Ben-Gurion: one nation, one gun, not innumerable armed forces with each firing in a different direction”, the New York Times reported. He further claimed that Arafat kept saying No in Arabic (la, la, la) but at the end said yes to what Peres told him, and added that “Arafat lied to him, with no problem”, as Peres was referring to “Arafat agreeing to fighter Palestinian fighters”, described by Peres are militants and insurgencies”. Furthermore, Peres claimed that he “protected Arafat from several plots against his life”, and plots meant to remove him out of Palestine. As for Israel assassination policies, Peres said that he opposes Israel’s use of targeting killings, and opposed Israel’s use of targeted killing as a means to achieve its goals. He further stated that he also opposed the assassination of Khalil Al-Wazir (Abu Jihad) who was the deputy of Yasser Arafat, and was assassinated in Tunisia by an Israeli death squad, under direct orders of the Israeli Mosad, on April 16, 1996. Twenty well-trained Israeli assassins working for the Mossad (Institute for Intelligence and Special Operations) were deployed at a Qurtaja shore in Tunisia; four ships, two submarined and two Israeli military hellicopeters were deployed in the area, and when Abu Jihad returned to his home, the Israeli commandoes and assassins headed to his home, killed his guards and went to his room where they fired several bullets at him. It is believed that he was shot by 70 rounds of live ammunition. Peres added that he does not agree with Israeli Prime Minister, Benjamin Netanyahu, in his policies towards current Palestinian President, Mahmoud Abbas. Peres further claimed that Jewish settlements in the West Bank “did not void the two-state solution”, and added that Israel’s Jewish settlements in the West Bank, including in Jerusalem, “are only built on 2% of the Palestinian territory”. 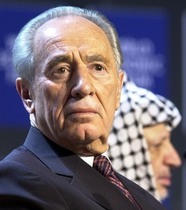 Furthermore, Peres claimed that the Palestinian issue is not the main issue in the Middle East, but admitted that it is affecting Israel’s relations with 1.5 Billion Muslims in the world, and added that “once the conflict is resolved, extremist Islamists will not have an excuse to continue to attack us”, according to the Israeli President. 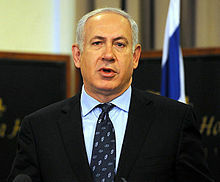 As for the current Israel government headed by Prime Minister, Benjamin Netanyahu, and its inability to advance talks with the Palestinians, Peres said that “the problem is not with Netanyahu, the problem is his coalition partners”, referring to extreme right-wing fundamentalist coalition partners such as the extremist “Israel Our Home” party led by Foreign Minister Avigdor Lieberman, who is also a settler and continuously denies the legitimate Palestinian rights, and in the past repeatedly called for their massive expulsion to Arab countries. Lieberman also repeatedly stated that the Arabs and the Palestinians are a “strategic threat to the Jewish State”. The Israeli President further said that he does not claim that peace with the Palestinians would lead to resolving all issues in the region, and added that “achieving this peace in not an easy task”. Yet, the Israeli president said that he fully supported the latest Israeli military offensive on Gaza, and claimed that the operation “was not a war or a military offensive, but a lesson to Hamas”. He also claimed that Israel “tried its best not to harm civilians in Gaza”, and added that “sometimes it is very difficult to differentiate between Hamas gunmen and innocent civilians”. He also claimed that Israel tried to tell Hamas that it has no objection to building homes in Gaza, but will not allow the movement to build rocket launchers. The November 2012 8-day Israeli war on Gaza, led to the death of 191 Palestinians, including children, women and elderly, while at least 1492 Palestinians have been injured, dozens seriously. 8 children, including 16 under the age of five, have been killed by Israeli missiles and shells during the war, in addition to 12 women and 20 elderly. Palestinian President, Mahmoud Abbas, stated that the Palestinian Authority will act on the international level to stop Israel’s illegal settlement construction and expansion activities, and stated that there are 63 UN organizations that the Palestinians can now join. PNN- As Fatah and Hamas met in Cairo to discuss reconciliation, Israel's Prime Minister, Binyamin Netanyahu, said he would not cede any more land to the Palestinians. Palestinian President Mahmoud Abbas and Hamas leader Khaled Mashaal were expected to meet in Cairo today to discuss the national reconciliation and ending the dispute between Fatah and Hamas. Hamas and Fatah officials said that the Cairo talks would focus on ways to implement previous reconciliation accords reached between the two movements, first and foremost the formation of a Palestinian unity government and holding long overdue presidential and parliamentary elections in the West Bank and Gaza Strip, JPost reported. Palestinian sources said that following the Abbas-Mashaal meeting, Fatah and Hamas officials will hold separate talks in Cairo to pursue efforts to end the dispute. As noted earlier, the Hamas delegation is also scheduled to hold talks with Egyptian intelligence officials to discuss ways to solidify the current cease-fire in the Gaza Strip. Palestinian President, Mahmoud Abbas, stated that he is willing to continue to cooperate with the United States and the Obama Administration to achieve a peace agreement with Israel based on the two-state solution. The statements of Abbas came on Tuesday evening during a meeting, in Jordan, with the visiting U.S. Middle East Envoy, David Hale, the Palestine News Network (PNN) has reported. Hale told Abbas that the United States is committed to the two-state solution, and will continue its efforts to reach this goal, and stressed on the importance of the resumption of peace negotiations between Tel Aviv and Ramallah. Abbas said that “he appreciates the stances of the U.S. Administration as it considers peace in the Middle East as a top priority”, PNN reported. The Abbas-Hale meeting was attended by member of the Executive Committee of the Palestinian Liberation Organization, Dr. Saeb Erekat, and official presidency spokesperson Nabil Abu Rodeina. The meeting took place while the U.S. and Israel continue their financial sanctions on the P.A. for heading to the United Nations, and for managing to upgrade the status of Palestine at the General Assembly to a nonmember state. Tel Aviv and Washington said that the state of Palestine can only be achieved through direct peace talks between Tel Aviv and Ramallah. The U.S. and Tel Aviv also rejected a decision made by President Abbas Sunday ordering the Palestinian Authority to start issuing Palestinian Passports, ID Cards, Postage Stamps and License Plates carrying “State Of Palestine”, instead of the Palestinian Authority. U.S. State Department Spokeswoman, Victoria Nuland, stated that, until peace negotiations between Israel and the Palestinians lead to the establishment of a Palestinian state, the United States will not refer to the Palestinian Authority (P.A.) as the state of Palestine. Her statements came in response to a decree issued by Palestinian President, Mahmoud Abbas, to rename the P. A. as the State of Palestine, and to change all official documents to reflect this modification. In a press conference Monday, Nuland said that “a Palestinian state cannot be created through speeches and documents, as states are established through talks and negotiations”. It is worth mentioning that the U.S. stance is coherent with the position of Tel Aviv as Israeli Prime Minister, Benjamin Netanyahu, stated that Israel rejects the decree and will not recognize it, and added that “the Palestinian state can only be born through a peace agreement with Israel”. The decree that was issued by Abbas calls for using the name State of Palestine on all official documents, this includes passports, ID cards, driving licenses and official letterhead within the coming two months. The Abbas-led P.A. in the West Bank had to quit peace talks with Tel Aviv due to Israel’s ongoing violations against the Palestinians and their property. These violations are topped by Israel’s construction and expansion of Jewish settlements in the occupied West Bank, including in and around occupied East Jerusalem, and the ongoing demolition of Palestinian homes in the city. Dr. Sami Abu Zuhri, a Hamas spokesman, has said that the US Middle East envoy David Hill’s visit to the region aims at giving the impression that negotiations between the PA and Israel were still ongoing. Hill is slated to arrive in Ramallah on Tuesday for a meeting with PA chief Mahmoud Abbas. Abu Zuhri told Quds Press that Hill’s visit would not change anything on the ground in light of the incessant Israeli occupation crimes and the American administration blind backing of the Israeli positions. British Foreign Secretary William Hague Tuesday said the year 2013 offers new opportunities for peace in the Middle East. Hague said in a statement after meeting Arab League Secretary General Nabil Elaraby that they discussed the Middle East peace process and agreed that 2013 offers new opportunities to end the Palestinian-Israeli conflict through negotiations. “We expressed the shared hope that this year will be the ‘year of peace’ for Palestinians, Israelis and all people of the region,” he said. The Arab League and European Union member states need to assist the Palestinian Authority to overcome its current financial difficulties and that Israel should fulfill its obligations to transfer customs revenues due to the Palestinian Authority, said the British official. The two officials discussed as well the situation in Syria and efforts to achieve a political transition and an end to the violence. Egyptian president Mohamed Morsi said he will sponsor a meeting between Hamas and Fatah leaders in Cairo soon to resume the national reconciliation talks. 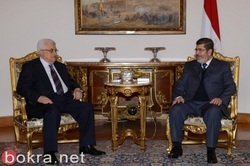 In an interview by the CNN, Morsi added that he had invited Mahmoud Abbas and Hamas political leader Khaled Mashaal to come to Cairo to table the contentious files and the mechanism to implement them on the ground. He stressed that the achievement of the national reconciliation between the Palestinian rivals would not be an easy mission. In another context, Sheikh Ayed Qarni, an acclaimed Saudi religious figure, said in a press statement to the Palestinian information center (PIC) that the support provided for Gaza people by Egypt and its people is a sacred duty. Sheikh Qarni, who was in Cairo on Sunday, the noted Egyptian role in Gaza does not absolve the rest of the Arab and Muslim countries from their responsibilities. He also called on all Arab and Muslim leaders to pool their efforts in support of the Palestinian cause and Jerusalem, and condemned the situation of begging peace from the Israeli occupation as shameful. The leader in the Islamic Resistance Movement "Hamas" Rafat Nasif stated that the Israeli calls to displace Palestinians from the West Bank aim to complete the Israeli project of ending the Palestinian presence on the ground. "Such Israeli statements prove that peace talks with the occupier are empty talk, especially since the Israelis use the Palestinian issue as propaganda in their electoral battles," Nassif told Quds Press on Wednesday. Nassif stressed that "the Palestinian people will not leave their home again, or accept any offers to give up their land," adding that all these Israeli calls will not be translated on the ground because the Palestinians will not accept to be used in the Israeli electoral campaigns, pointing out that the Palestinians will work to regain all their rights suppressed by the occupation. The Israeli political activist in ruling Likud party, Moshe Vaigln, has called for the expulsion of the Palestinians from the West Bank and offering hundreds of thousands of dollars for each family in return. In addition, number of other Israeli figures from the right wing of the Likud party, including the Israeli minister Yuli Edelstein and the head of the current coalition Ze'ev Elkin and MP Yariv Levin, called for the annexation of the West Bank or parts of it to the Israeli entity, even gradually.